Trucks have big blind spots due to their large turning radius as well as their elevated height. These large blind spots mean that truckers are not accounting for significant portions of the roadway (which they cannot see!) when making turns or maneuvers. These “blind” turns and maneuvers sometimes lead to serious accidents with devastating consequences. 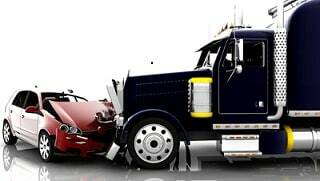 What Are Some Examples of Blind-Spot Truck Accidents? Our client advocates at Miller & Zois have won millions of dollars for truck accident victims both at trial and by way of out-of-court settlement. You can learn more about our work and record of success in truck driver negligence claims here. 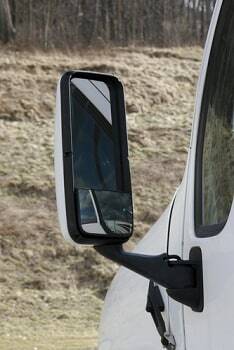 Due to the large size of trucks, they have much larger blind spots than any passenger vehicle, and blind spot accidents are much more prevalent. 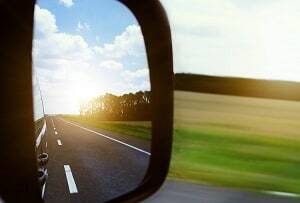 According to the United States Department of Transportation, over 413,000 automobile accidents are caused by truck blind spot accidents every year. Of these 413,000 accidents, almost 160,000 of them are fatal. Such accidents are typically severe and cause serious injuries or death due to the large size difference between the average passenger vehicles (around 2,500 pounds) and a fully loaded commercial truck (around 80,000 pounds). The risk of death dramatically increases when trucks strike defenseless motorcyclists, bicycle riders or pedestrians who are in the truck’s blind spots. Often, the truck drivers want to place the onus of responsibility on you to stay out of their blind spots. One of our lawyers saw just last week a truck with a sign that said, "If you cannot see my mirrors, I cannot see you." There is no question this is good advice to heed, right? But that does not absolve trucks of their obligations to follow the rules of the road like the rest of us. We have seen a lot of blind spot vehicle crash cases. The common theme from defense counsel is to claim that no reasonable person could have seen the vehicle in the rear because of the blind spot. For the most part, this is a garbage defense that is primarily used to scare victims in cases where there is no defense. That is what the insurance companies do. They also usually suggest the victim was speeding for good measure even though there is rarely the type of evidence available to make that allegation at trial. A large commercial truck changes lanes on a three-lane road and, failing to see the driver in the left lane that is in his blind spot, the truck cuts off that driver and causes a collision. A large commercial truck merges onto a highway from the entrance ramp, fails to see a motorist in his blind spot traveling in the adjacent lane, and collides with that motorist while attempting the merge. Ron is a truck driver. He is driving his 18 wheeler up I-270 North headed for Frederick to deliver a load to the local Home Depot. He merges onto I-270 North and slowly makes it all the way to the left lane of traffic where he travels the speed limit. After about 10 minutes, he realizes he is only a few hundred yards from his exit. Ron does not have much time to get over to the right to make his exit. Although he is aware that he has significant blind spots on either side due to the truck’s size, he is confident in his ability to operate the truck and he makes the maneuver into the center lane. He checks his rear view and side view mirrors again and makes a maneuver into the right lane, where he intends to exit the highway. As he enters the right lane, he hears a honk and then feels a loud and powerful crunch. He slows his 18 wheeler to a stop on the shoulder of the road. As he gets out, he sees David inside of his Honda Civic yelling for help. David is seriously injured after rear-ending Ron’s truck, which cut him off, causing a herniated disc David's neck, requiring surgery. Ron failed to account for his blind spot in making the lane change, which caused the accident that injured David. It is Ron’s carelessness and negligence, we would argue, that caused these injuries. Ron should be made to compensate David. Maryland: $500,000 Settlement. The Plaintiff was riding a bicycle in the District of Columbia when he stopped for a red light at the intersection. A dump truck owned by the Defendant was stopped at that same intersection. When the Plaintiff's light turned green, he began to pedal straight through the intersection while the dump truck driver made a right turn directly into the Plaintiff's path of travel. The Plaintiff was struck by the dump truck and, unbelievably, dragged nearly the entire length of a city block. Florida: $1,413,551 Verdict. A woman in her 60s died when her vehicle was struck by a tractor-trailer owned by the Defendant. The Plaintiff was traveling in the middle of three lanes when the truck-driver Defendant, who did not see the plaintiff who was in his blind spot, attempted to move into her lane of travel, causing her car to spin in front of the tractor-trailer, and causing a multi-vehicle wreck that killed the Plaintiff. Texas: $200,000 Verdict. The Plaintiff, an elderly woman, was loading her car in the parking lot of a department store when the Defendant, operating a truck, backed out of the loading area and into the Plaintiff. The Plaintiff was in the Defendant’s blind spot and the Defendant did not see the Plaintiff until after the collision. The Plaintiff suffered serious head, neck and back injuries. Over the years, Miller & Zois has compiled a fantastic track record of success in fighting to achieve compensation for victims of serious crash victims. We know how to fight these trucking companies and we know how to beat them. Contact us immediately at 800-553-8082 to find out if you have a claim or you can get a free case evaluation online.